For more than 30 years David A. Brown, Attorney at Law, has been assisting El Cerrito, Kensington, Berkeley, Albany, Richmond, Pinole, Hercules and West Contra Costa County, California, families with their probate and trust administration and estate planning needs. He offers the same caring concern to his clients as he does to his own family. There are complex emotions involved when a loved one passes away. Probate and trust attorney Brown works through every case, offering personalized attention in an effort to ensure that every detail is handled to the exact specifications of the client. Clients are left feeling confident that all aspects are being considered while their estate is in good hands. Throughout more than 30 years, Attorney Brown has developed firm roots in Bay Area communities, particularly the East Bay. He has a broad understanding of the concerns and needs of area residents. He applies this knowledge in planning for the future of his clients and their loved ones. 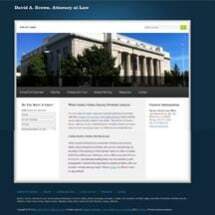 Clients of David A. Brown, Attorney at Law, have worked hard all their lives. With a thorough estate plan, Mr. Brown and his clients can ensure the protection of benefits, assets and the well-being of family. Early planning is key, contact the firm as soon as possible. The office of David A. Brown, Attorney at Law, is located at Hilltop in Richmond, California. Office hours are 9 a.m. to 5 p.m. Appointments may be made outside of office hours as needed. Call 510-417-4464, 510-527-7070 or 510-758-5100 or visit the firm's Facebook page for more information.